and other cities in and around Fresno and the Bay Area and Northern California. We will also travel anywhere in the USA. 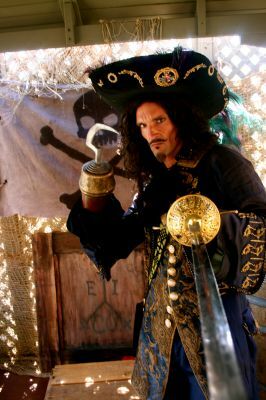 Let Captain Hook or Captain Jack entertain your guests at a pirate party or special corporate event in Fresno, Bakersfield, and the surrounding areas of Central California. Captain Hook and Captain Jack is a hit with kids and adults everywhere they appear. Call us to have Hook or Jack at your party or event. 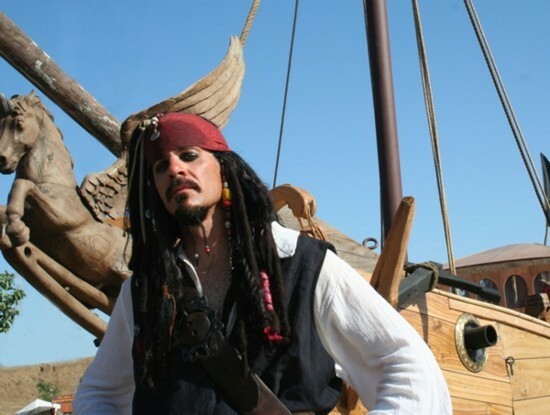 Call us for best pirate party entertainers in Central and Northern California for the ultimate pirate party or an unforgettable event in the Fresno and Bakersfield area, get a professional Captain Jack Hook or other pirate character for your very special event. We also provide other pirate characters and entertainers in authentic period clothing for your event. Our pirate characters are also very popular at a kids pirate theme birthday party or any type of children' s party including a pirate and princess party. A Jack Sparrow impersonator makes a perfect MC or host for your corporate meeting, company picnic, or public event and any adult pirate party. For a kid's pirate birthday party Jack will surprise the kids when he appears and will proceed to proclaim the piratical virtues of the birthday child and then initiate the birthday child into the Pirate's inner circle. He then makes the birthday child the honorary pirate captain and makes all the guests into a pirate crew for the birthday child to act as captain over the crew. There is a treasure hunt and then the pirate sword fighting training game. For all the details and to reserve your date and time call us.